Or be told that, as an actress, the part you're most fitted to play is `wife of a terrorist'? How does it feel to have words from your native language misused, misappropriated and used aggressively towards you? How does it feel to hear a child of colour say in a classroom that stories can only be about white people? How does it feel to go `home' to India when your home is really London? What is it like to feel you always have to be an ambassador for your race? How does it feel to always tick `Other'? 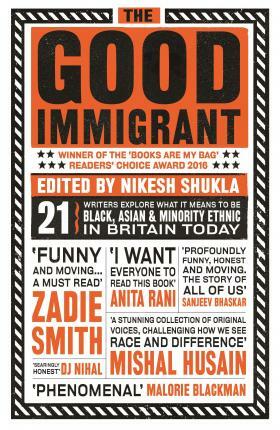 Bringing together 21 exciting black, Asian and minority ethnic voices emerging in Britain today, The Good Immigrant explores why immigrants come to the UK, why they stay and what it means to be `other' in a country that doesn't seem to want you, doesn't truly accept you - however many generations you've been here - but still needs you for its diversity monitoring forms. "The stories are sometimes funny, sometimes brutal, always honest … if I could, I’d push a copy of this through the letter box of every front door in Britain." Nikesh Shukla is a writer whose debut novel Coconut Unlimited (Quartet Books) was shortlisted for the Costa First Novel Award 2010 and longlisted for the Desmond Elliott Prize 2011. In 2011 he co-wrote with Kieran Yates an essay about the London riots, Generation Vexed: What the Riots Don't Tell Us About Our Nation's Youth (Random House). In 2013 he released The Time Machine (Galley Beggars Press), a novella about food which won Best Novella at the Sabotage Awards. His second novel, Meatspace, was published by The Friday Project, his short stories have featured in numerous anthologies and magazines, and he has previously been writer in residence for BBC Asian Network and Royal Festival Hall. He currently hosts The Subaltern podcast, an anti-panel discussion featuring conversations with writers about writing. Guests have included Zadie Smith, Junot Diaz, Teju Cole, James Salter, George Saunders, Jennifer Egan, Evie Wyld, Sam Bain, Alex Preston, Colson Whitehead and more. He also co-hosts a podcast with sci-fi writer James Smythe, Meat Up, Hulk Out.